Blot on the landscape – Not! 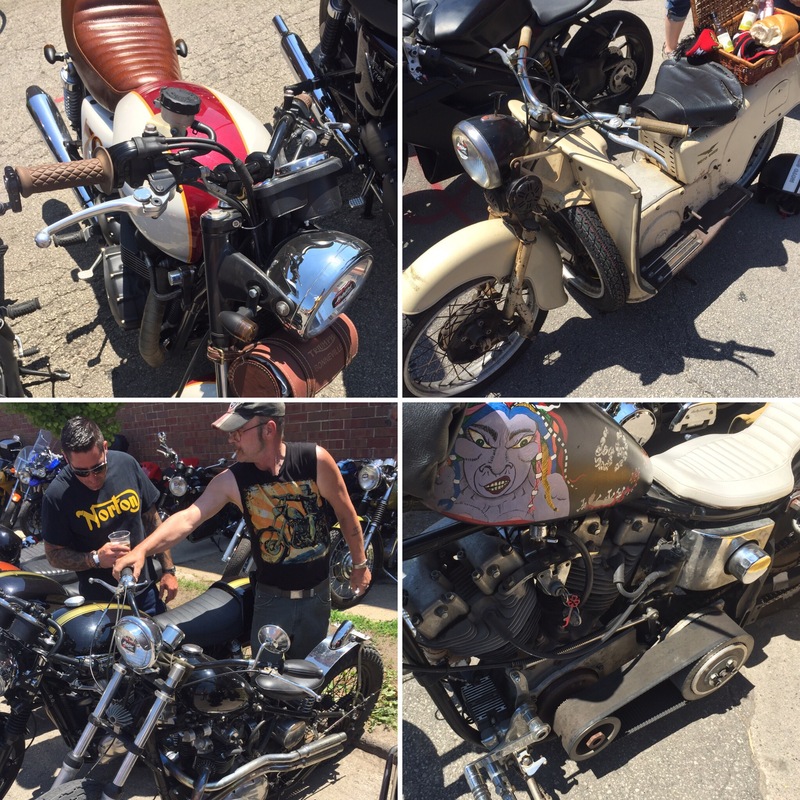 A few more images to share highlighting the varied vitality of the Motoblot scene. 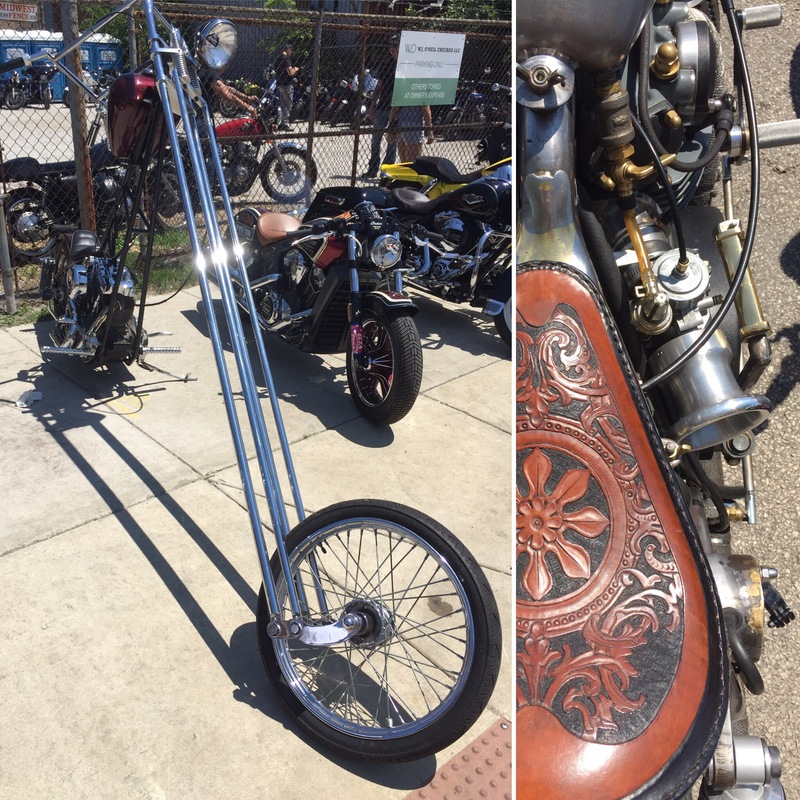 Choppers, custom engines and saddles, gams on the go and hotrods. Oh, and not to mention motorcycles. Look out for that picnic basket laden Moto Guzzi scooter! 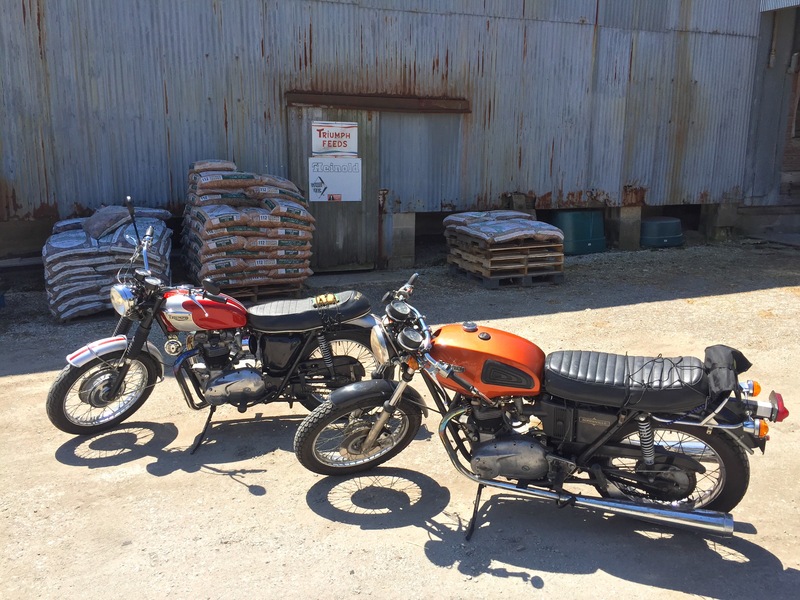 Fabulous day in the saddle taking the Bonnie’s around to Michigan. An early start saw a quiet Riute 12 with naught but the shadows playing across the road ahead. 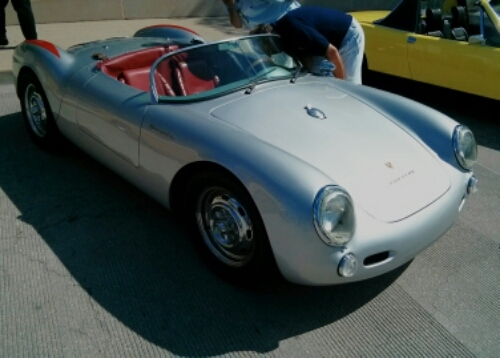 This quicksilver toned Porsche Spyder stopped us in our tracks. A race-spec engine growled as the owner sped off from the seasonal grocery store it was parked near. 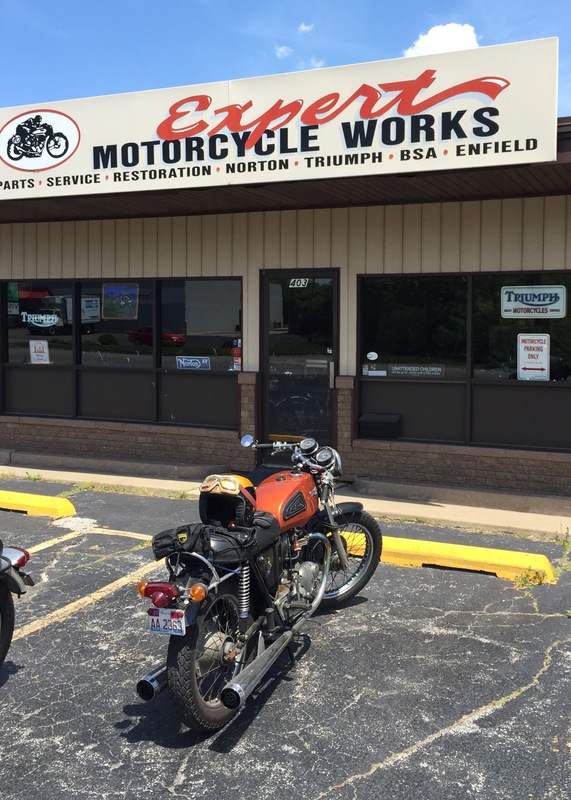 Also included in the ride was a short drop.-in to the amiable Bob Goodpaster at Expert Motorcycle Works in Hobart Indiana. 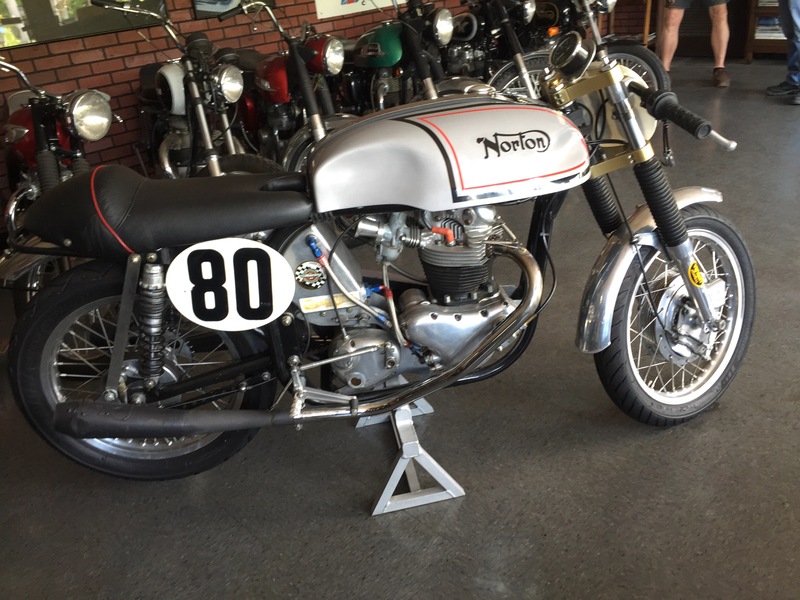 A glorious racing 650cc Norton sat in the front showroom floor. A serious track iron that sees unobstructed chequered flags across the country at vintage racing meets. 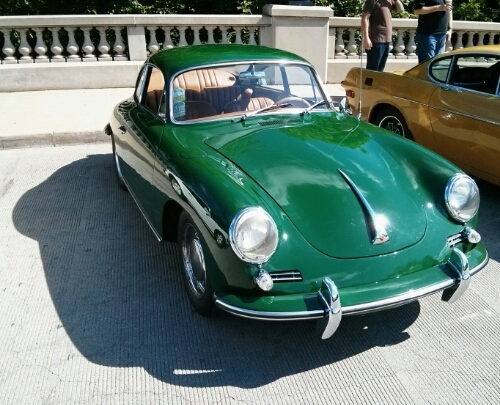 Before computers drove the shape of the aerodynamic form it was up to the car designer to devise of the curved lines of bodywork to wrap the chassis, engine and seating compartment. Sculpture on wheels each with a face and body as recognizable as any old family member. Art becomes Art. Looking at, and analyzing, the outline of these beauties, seeing how the curve flows. There are details that become the marques signature: BMW’s central grill for example. The 2002’s shows this off well. 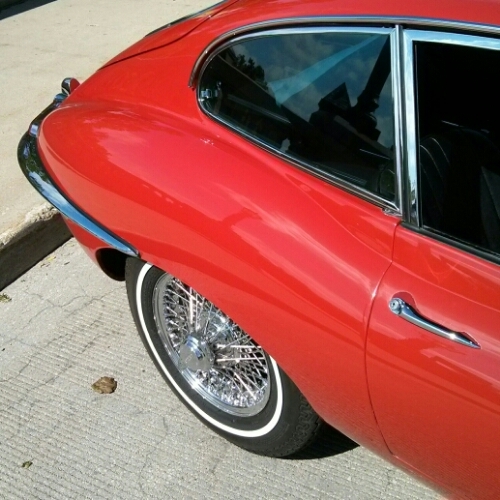 An E Type’s rear end complements the long engine-full front so well. Perfection! Even a German next to an Briton looks sumptuous. 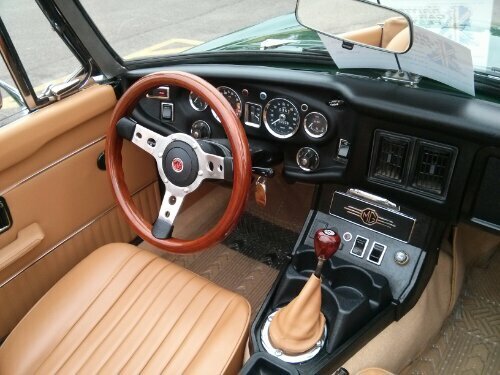 *I didn’t get any images at this car show of walnut dash and leather seat or wood steering wheel and Smiths clocks… Next time! When funds allow, or rather if funds allow. 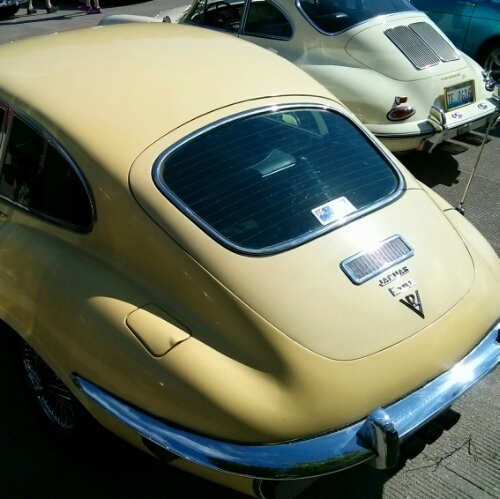 There could be nothing nicer than being the proud owner of a classic vintage automobile. 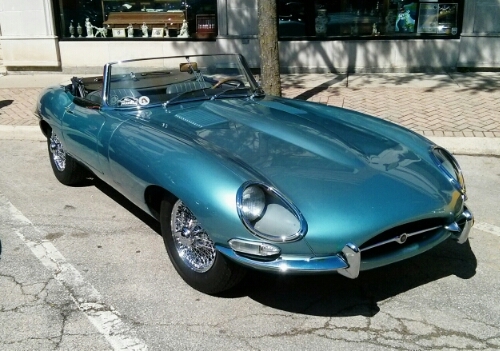 Soft top XKE? Why yes sir! 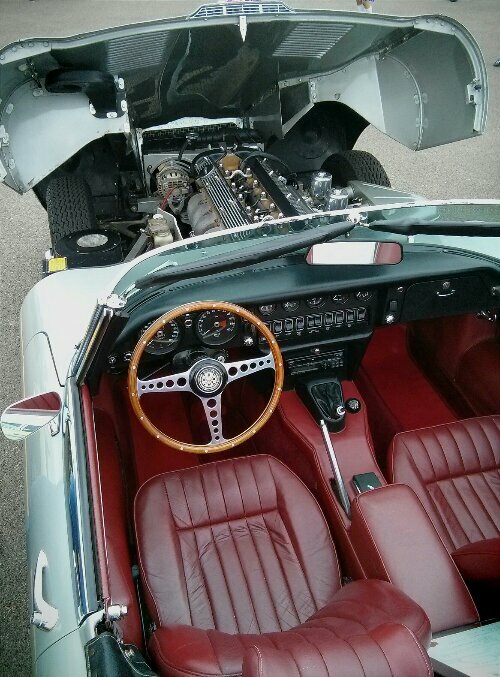 Especially if it holds the big V12 5.3l ‘gin. 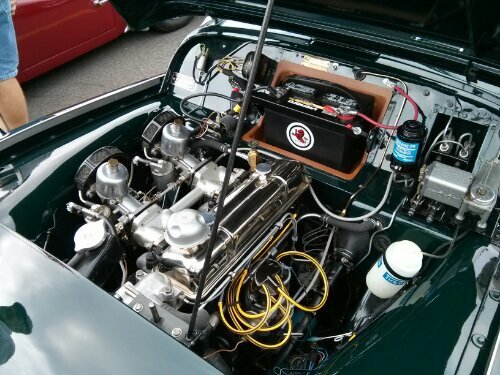 Another owner was kind enough to open the bonnet to reveal this hearty powerplant. With a sound like an Elgar piece. 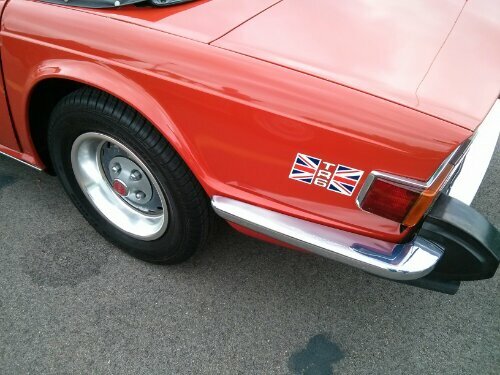 True Britishness. 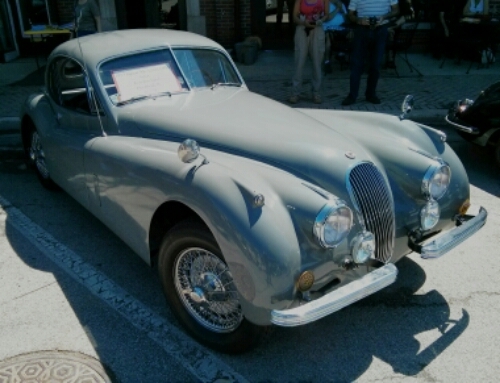 Jaguar have some other special vehicles: here’s the XK120 coupe. Grey like a black and white movie. 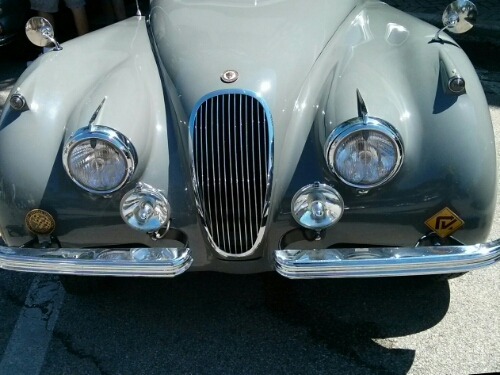 Knock-off hubs, split windscreen and a Jag grill. Astounding machine! The Germans were at it too! 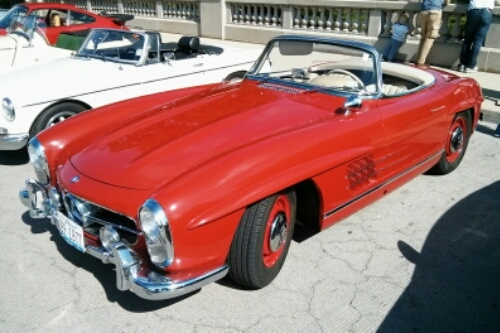 Mercedes Benz SL300. 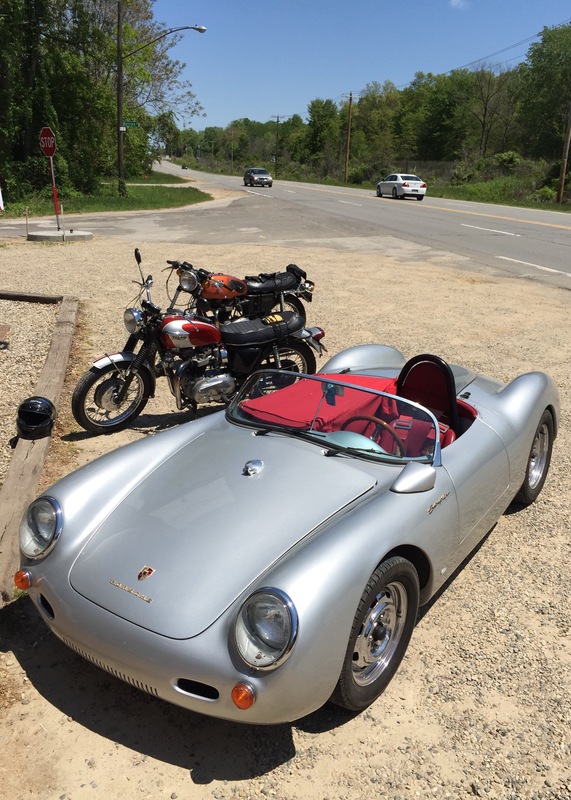 Roadster to rip along the tarmac whist playing Wagner. 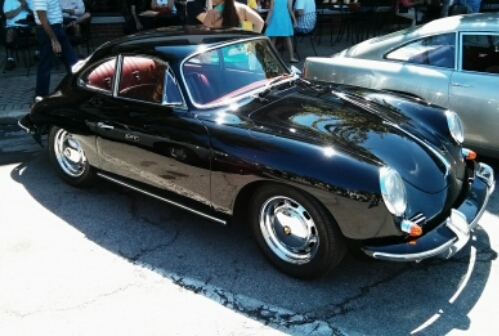 The other German: Porsche’s sweet little coupe. 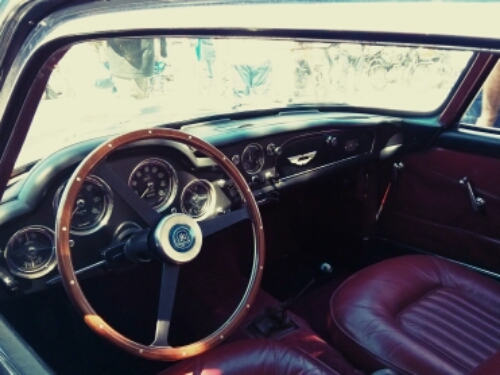 Their original sports car. The purest aerodynamic form. A Beetle that goes fast! This Schwartz model was sublime. Green is fine too! 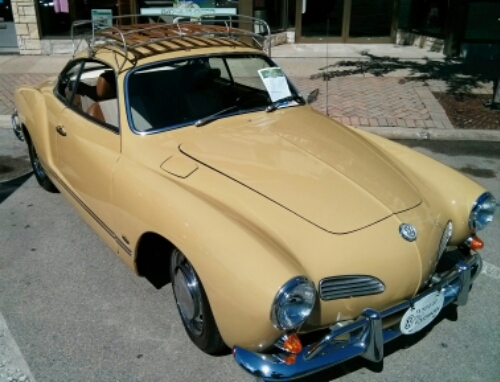 Crossover design to siblings Volkswagen with their neat looking Karmann Ghia. Style for the middle classes. 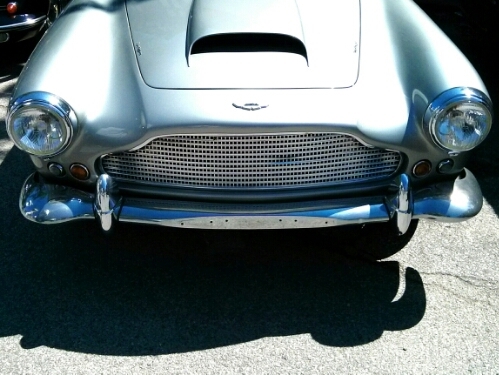 The King: Martin, Aston Martin. DB5. 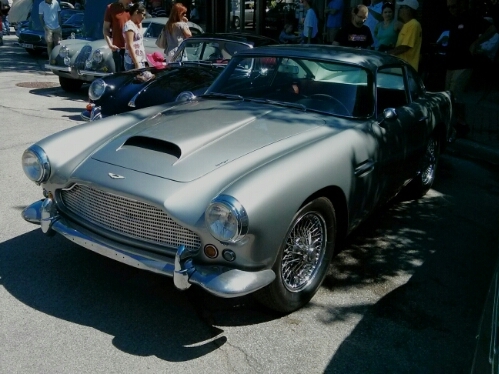 This one didn’t have the machine guns or ejector seat… But that silver grey in sunlight is legend. 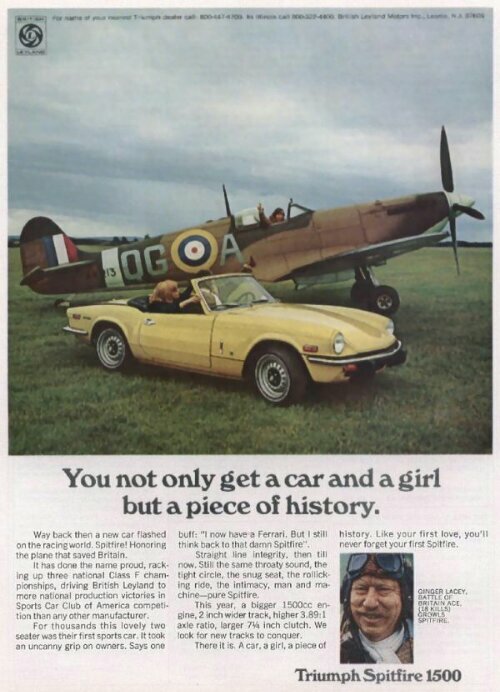 When cars were named after heroes: the Triumph Spitfire was one such; a two-seater 1500cc powered roadster that heralded the best of British spirit. 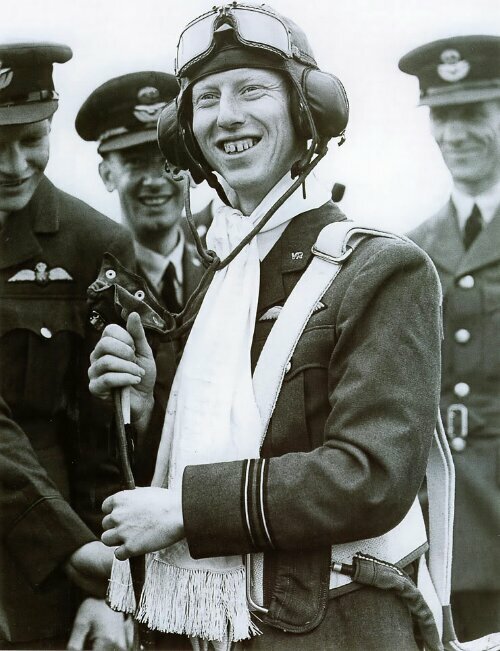 WWII ace Ginger Lacey cheekily grins from his flying cap, he saw tremendous action in the 1949 Battle of Britain over the southeast as well as flying over Japan during the close of hostilities. 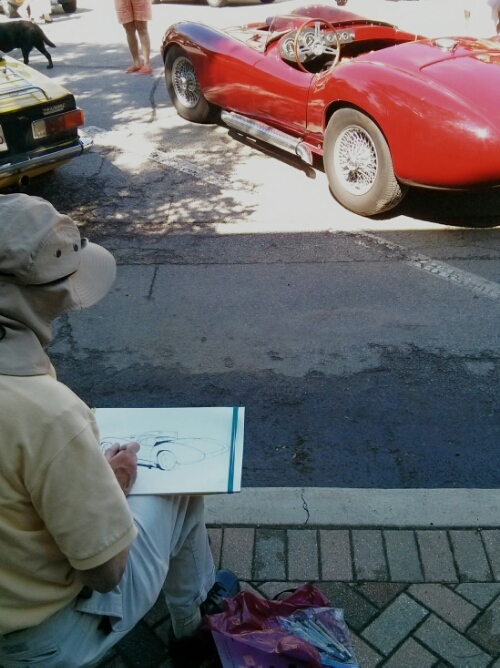 This car needs a white silk scarf a-flutterin’ behind the driver to evoke its namesakes legacy. Ginger is true ‘boys own’ stuff with 28 definite downed aircraft to his name he gained the DFM with Bar. 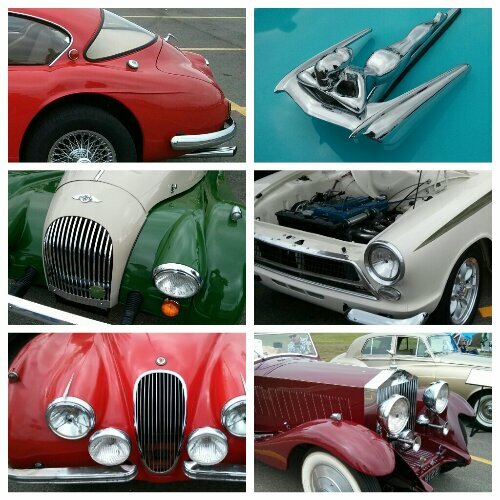 With numerous marques, models and mechanicals to be seen at last weekends car show I’ll conclude the week with a collage of images for your perusal. 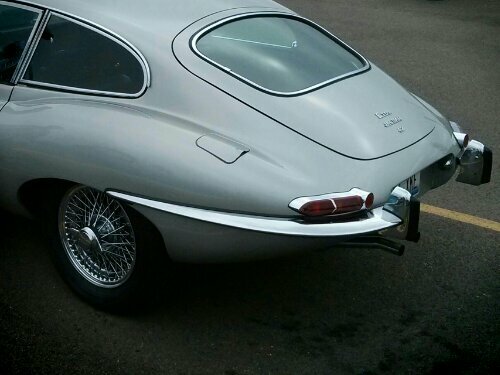 On its release Enzo Ferrari called the E-Type “the most beautiful car ever made”. Many agree; me too. Its shape is one of pure perfection from all angles, all the curves flow as one in sinuous beauty. 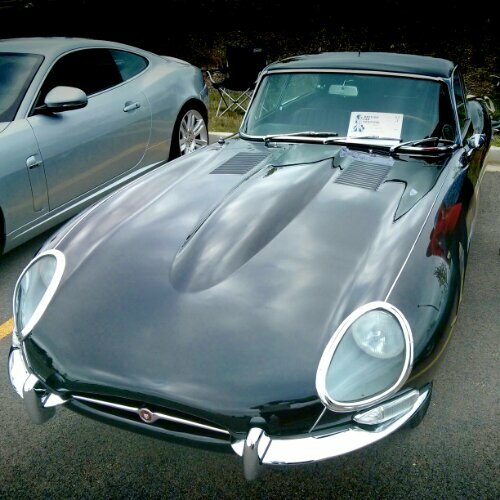 Its aeronautical inspired streamlining derive from the eye of Malcolm Sayer 1916-1970 who’s vision derived to fine style the C, D and E Types as well as the godly XJ13 and XJS. Aircraft design borne principles were utilized to magnificent effect on the roads and race tracks of England. 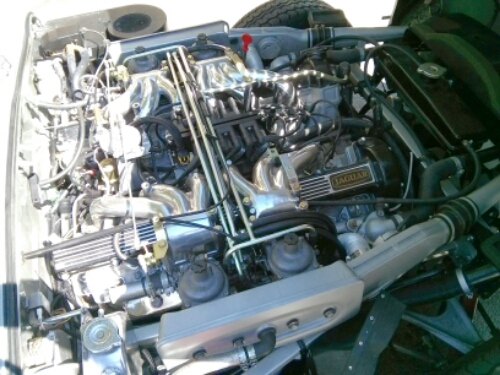 A 4.2l powerplant could take a leadfoot from zero to sixty in about seven seconds topping out at a ton and a half with the 265bhp under that l-o-n-g bonnet (on a good day, with a factory fettled car). 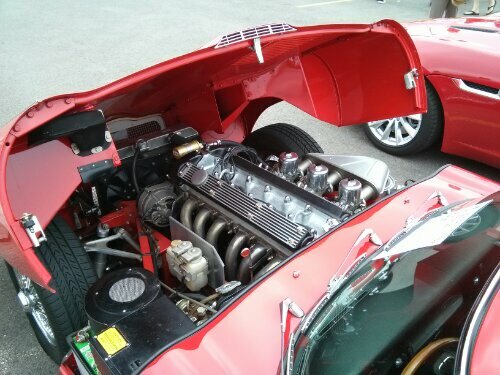 Like the Spitfire the entire front end flipped up for adequate access to the inline six and its triplet of carburettors. 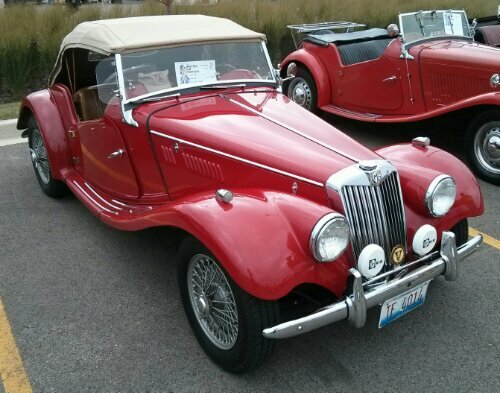 Swallow Sidecars was the original name of Jaguar cars before the war however the initials SS had different connotations after then so a 30’s model name was chosen for the new company brand. A cat was a good choice! The Amazon? That’ll be 36D-22-36 to you sonny Jim; Norma Jean to the world. 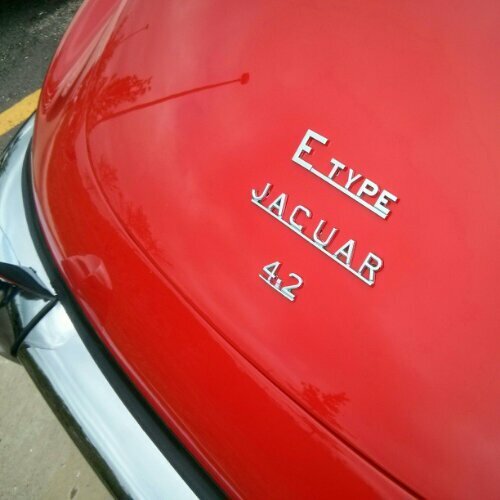 The E-Type arrived in ’61, M.M. left us in ’62… Do you believe in reincarnation? 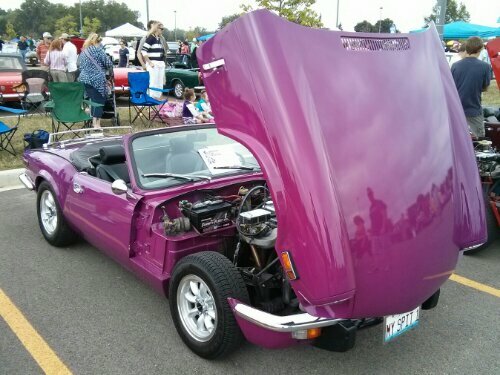 The seventies saw some garish color schemes in cars; none more so than witnessed in this Triumph Spitfire… However its speedy profile can be seen even with the open hood; a hood that flips up with the fenders giving great access to the engine area. 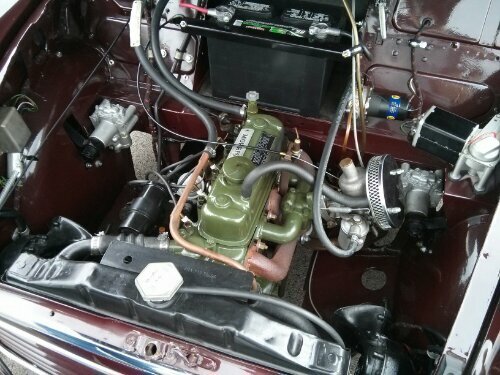 The fairly simple 4 speed 1.3l shown here with an immaculate example was fed with a pair of carburettors. 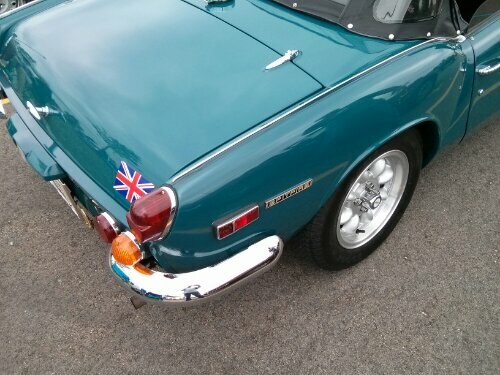 With about 75 bhp on tap and the light frame these were nippy cars. Teal: great color choice! 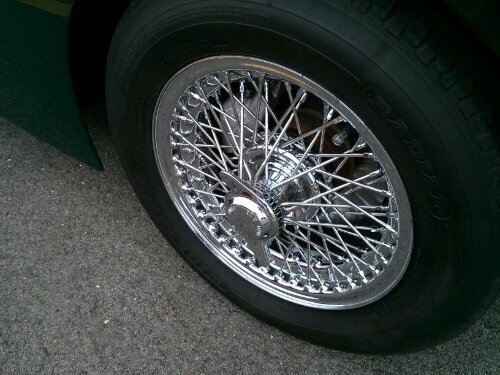 And of course wire wheels were an obvious option. Of course being a British car a well tool’d kit is required for those side-of-the-road fixes that you’d no doubt have at some point or another. 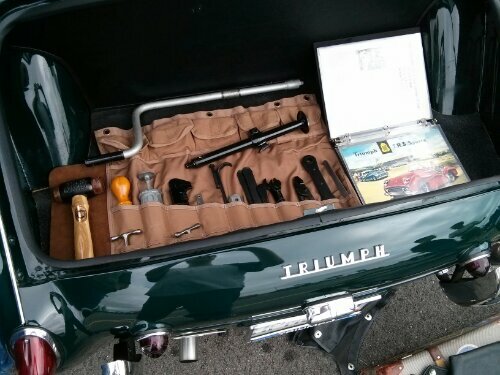 This is the trunk of an early TR3. The sharp end? 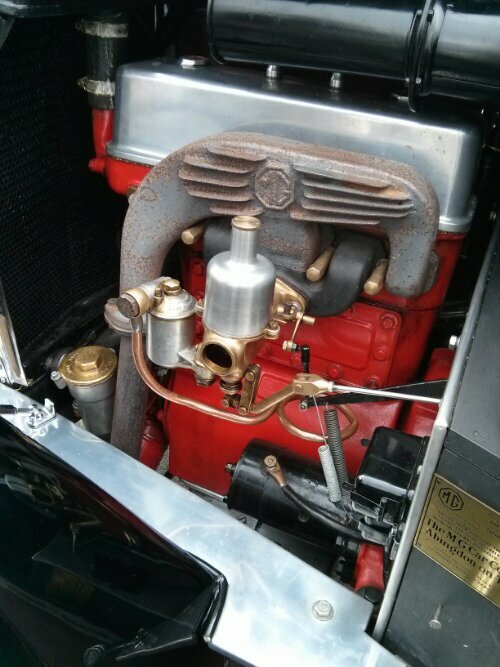 Well another fine example of clean engine restoration and care. Ten out of ten. Gorgeous! A pure white mark II has a cracking line to it too. Goggles, gloves and silk scarf de rigeur for the pilot here! 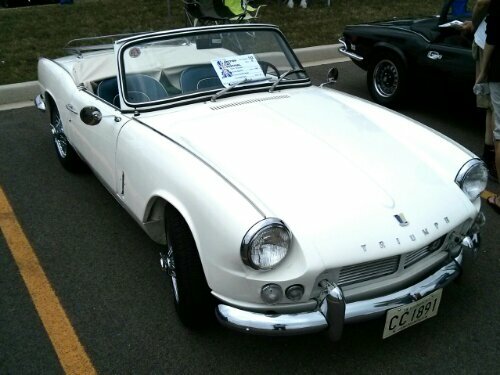 Currently my favorite Triumph car is the TR6. A bit more muscle with the 2.5l inline 6 and 150 ponies in the fuel injected home model (the US got 104bhp with a detuned carbureted engine.) And, the cockpit view ain’t that bad either. Well I probably won’t be able to afford a Porsche neunelfer but a nice clean TR6 with a few mods would suit me nicely thank you very much! 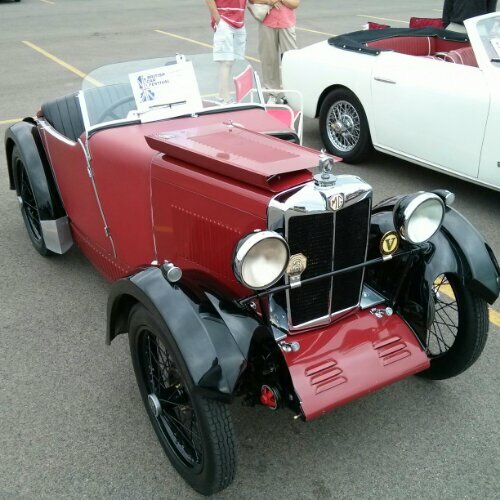 Formed in 1924 by Cecil Kimber the British roads were introduced to the rort of the sporty two seaters by MG.
Long elegant lines, a roadster for the A and B road driver. 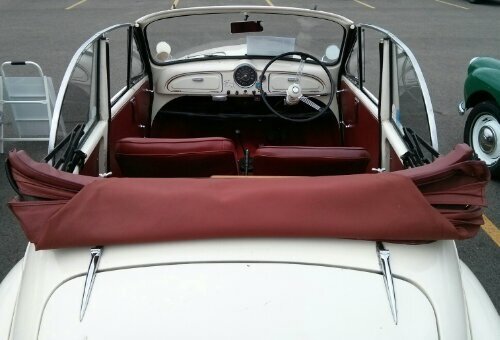 Soft top up for drizzly weather or down to get a bit of wind through your feathers. The long bonnet, sweeping fenders and sleek appearance look like a greyhound ready to pounce down the track. 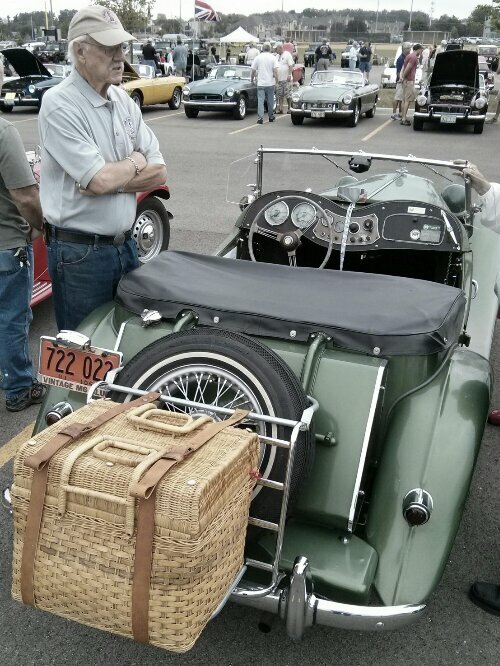 You can strap a basket on the back to go further afield. A trip to the Cote d’Azur? Via the Alps of course! 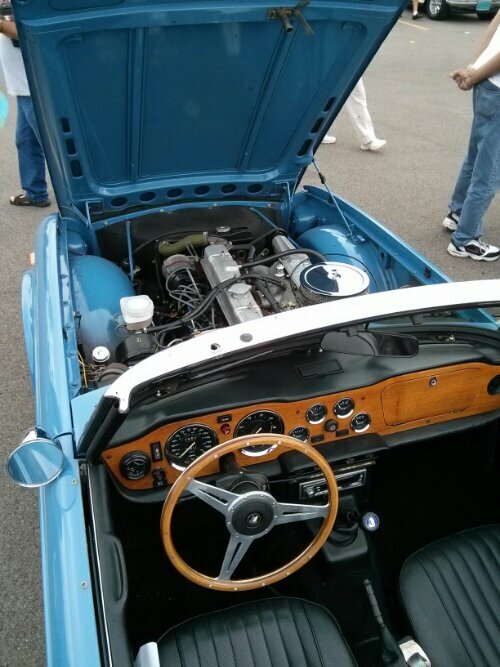 There were small cars too, the Midget; starting life as a basic roadster with a diminutive engine.. 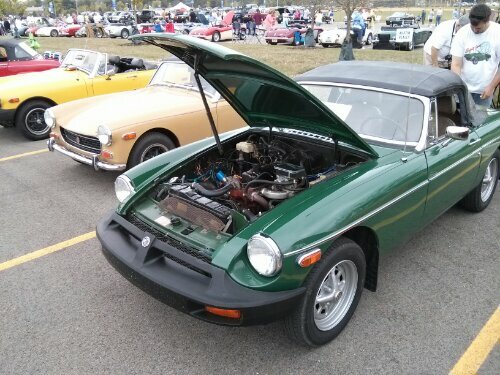 However, the sixties came and a new model was sought: the MGB which would see a fairly good run over two decades of sales. Even through the bleak British Car industry demise of the seventies; however that debacle would cause the end of that run. That pale yellow color is pure English. Even bright under a gloomy blighty sky, with a hint of rain in the forecast. The spoked wheels with knock-off hub nut will sparkly at speed, a chrome bumper rounds of a neat package. However with a half-life of Three years in the British climate you had to enjoy it quickly. The Mini: surely Issigonis’ shining gem. And what a diamond it is too. 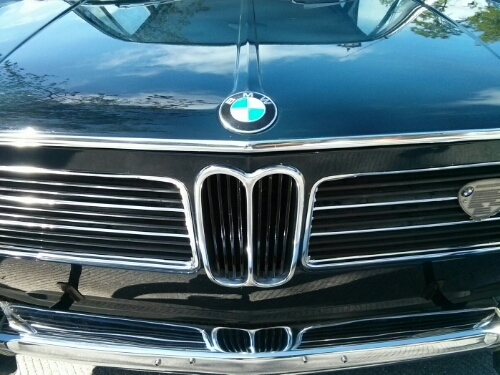 Where the version 2.0 from the good folks at BMW has gone from strength to strength the original is a hard one to beat! 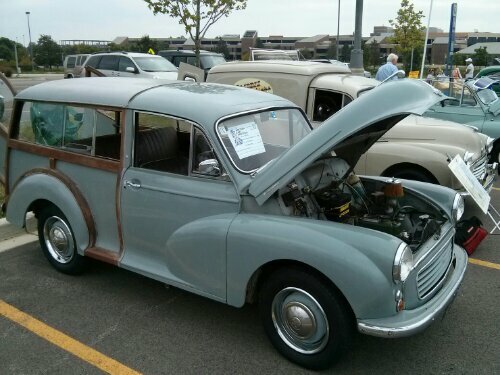 Wide wheelbase with smaller wheels on the corners of a shorter chassis and that Series A Morris engine turned sideways, the smaller and very functional proportions with good handling were apparent from the get-go. 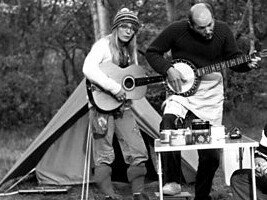 It went on to be as iconic as The Beatles in the sixties; a swingin’ time for all. The roof was oft emblazoned with the union flag. Front spots reinforced the round-eye headlights and aided nighttime driving as well as celebrated the sweeping victories of several Monte Carlo rallies through the sixties (until the French changes the rules citing uncompetitive lighting…). 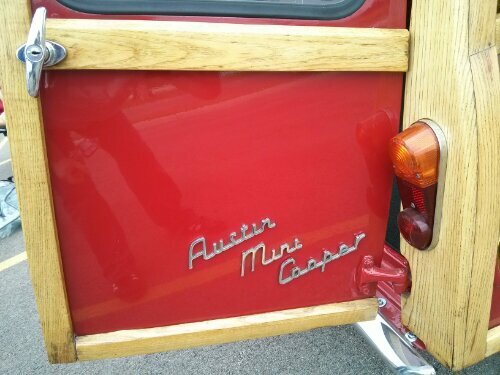 Also available was the Jeep like Mini Moke, and the sportier engines Cooper S. Racer of both two and four wheels, John Coopers collaboration with BMC to produce a highly competitive performance motor car. 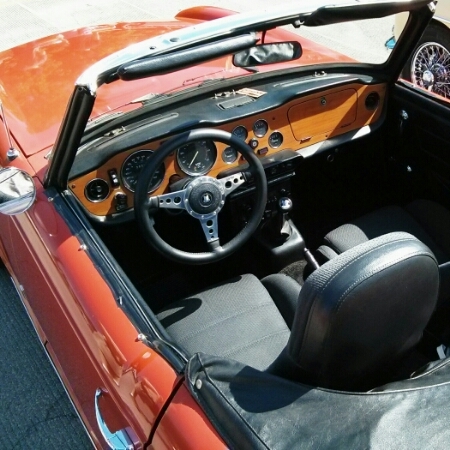 The best view of a Mini! 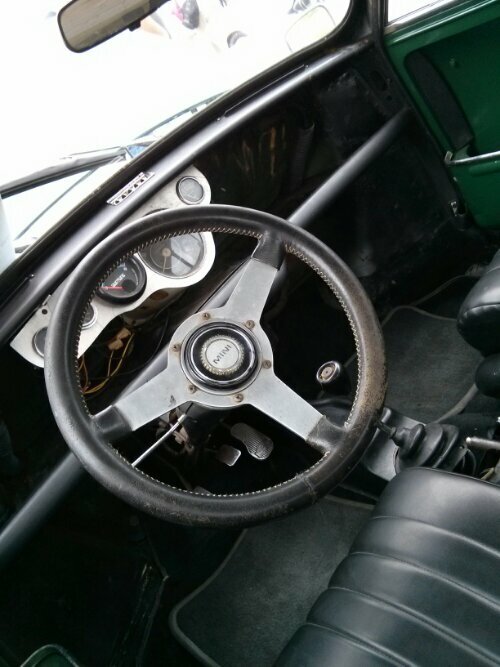 Behind its go-cart handling wheel, centrally located speedo and 360° all round clear view. 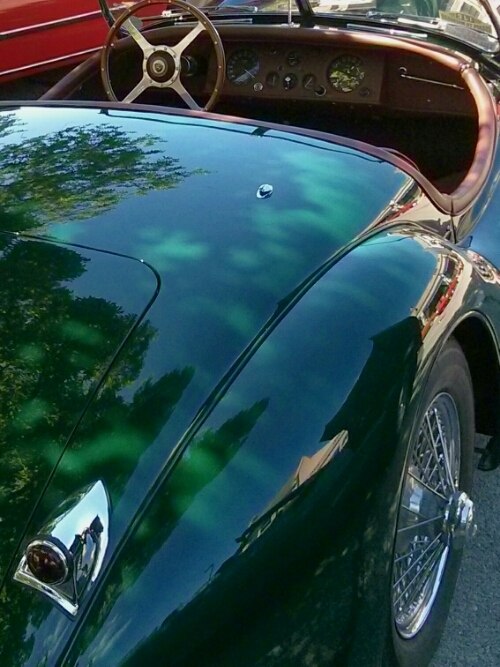 One of the cars I learned to drive in was a latter model Cooper, a racing green late 80’s model. One of the best cars I ever drove. 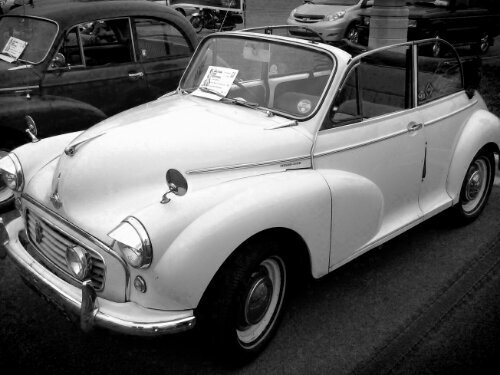 The Morris Minor, or Moggie as it was affectionately known, was a popular, inexpensive, compact family car. Easy to maintain, purely functional and fairly easy on the eyes is was manufactured between 1948 and 1971 seeing over 1.3 million produced. The blighty VW Beetle or Citroen deux chevaux. 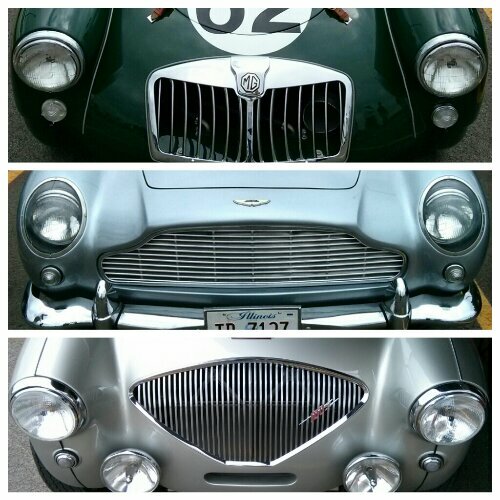 Its wholesome lines came from the mind of Alec Issigonis (the chief designer of The Mini). 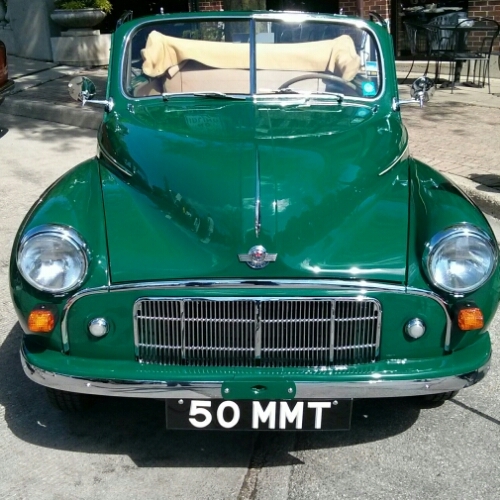 Like some matronly nurse it took to the British roads like the proverbial duck to water. 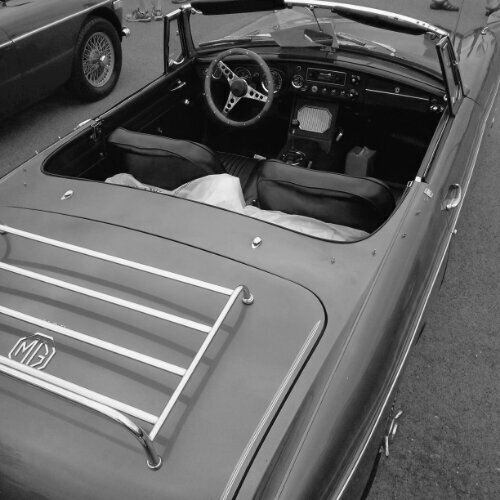 It saw many versions including the gnatty soft-top convertible seen above as well as the classic wood framed estate Traveler and delivery van. Both below. That battleship grey colour is pure blighty mid-fifties and a holiday to Llandudno. 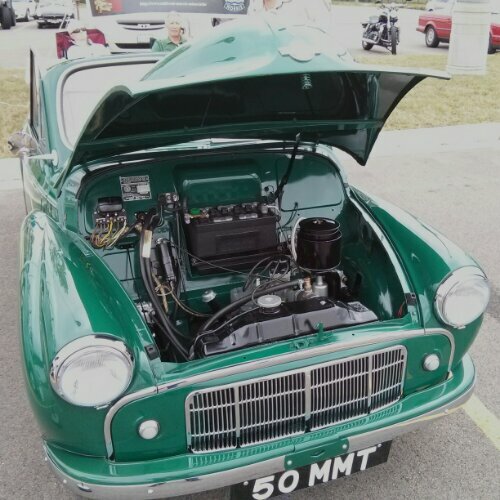 Diminutive power was conjured up from compact sub litre power units derived from the predecessor Morris Eight, however early engine bay layout is wide enough for an envisioned flat four (like a Beetle) but the sidevalve inline four is utilized. 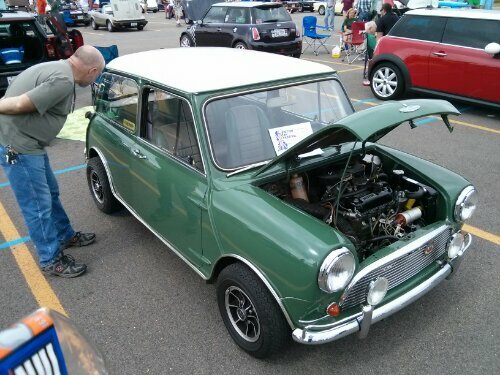 Here is a very early MM looking lively in its original green. The Lucas battery is bigger than the 27 bhp engine. Probably heavier too! Here’s another pristine engine bay, everything is obvious and with room for any home mechanic to keep his transport on the road. 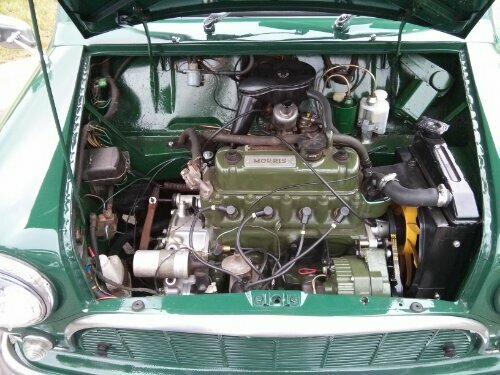 This is the A Series overhead valve inline four which went on, with ongoing evolution, to see half a century’s production in The Mini. 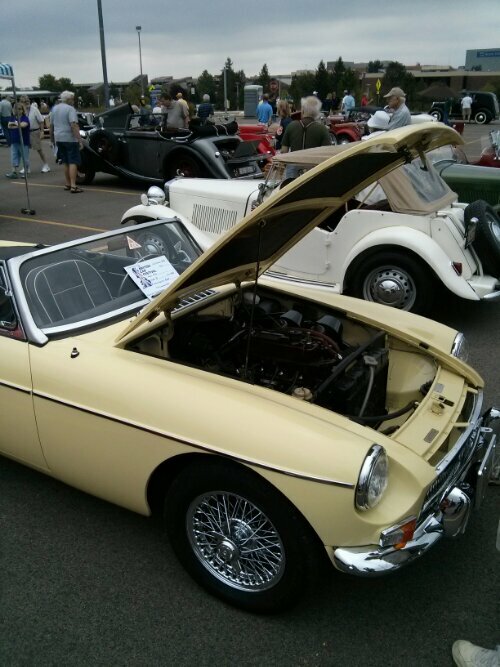 Sir Alec spun it 90° to ensure that compact cars place in history. 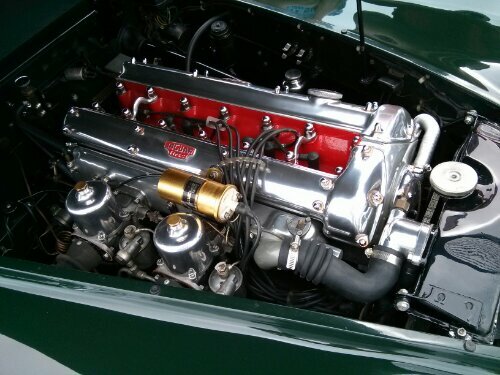 This ‘motor’ was developed by famed engine designer Harry Weslake who would go on to design the powerplants of Jaguars (later this week) and had indeed been involved in the Rolls Royce Merlin engine – arguable one if the Best sounding engines ever – especially at speed from a Supermarine Spitfire. 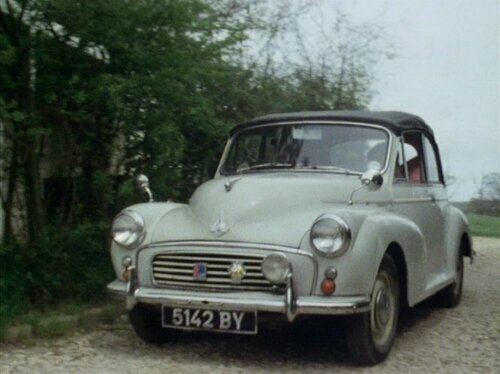 And besides it’s the car used by Keith and Candice Marie on their rural trip in the much loved Mike Leigh drama Nuts in May. You know you always tell me to chew everything 72 times? Well I don’t think that can be right, because, um for instance you’re chewing nuts now, and they have to be chewed 72 times because they’re very hard. But earlier on I was eating mushroom, and I only got to 31 and it slipped down my throat quite naturally. So it doesn’t always have to be 72 times does it? [long pause while chewing] I think the important thing is to uh, use your discretion. 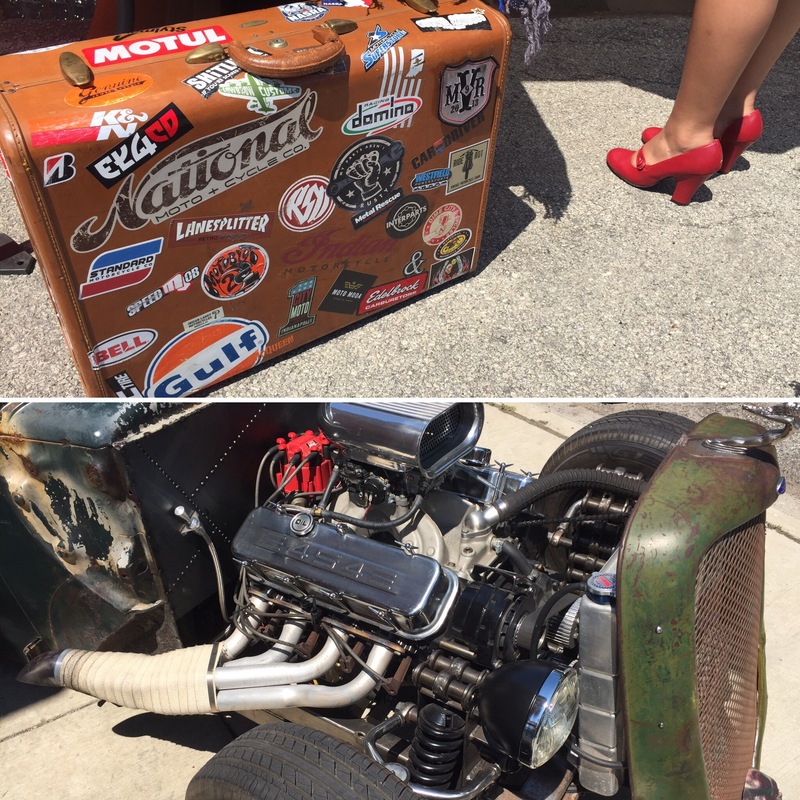 Car Week! On Geordie Biker blog this week. 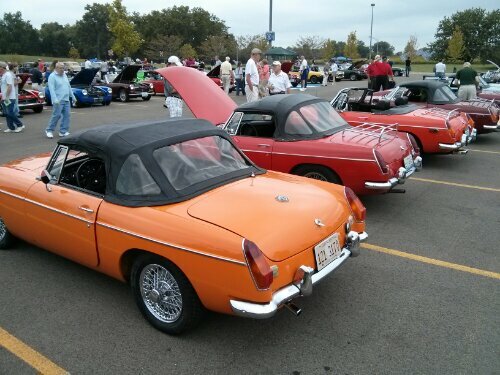 The Palatine vintage British car show was held today in the spacious Harper College campus lots. Numerous examples of all the popular marques were represented. 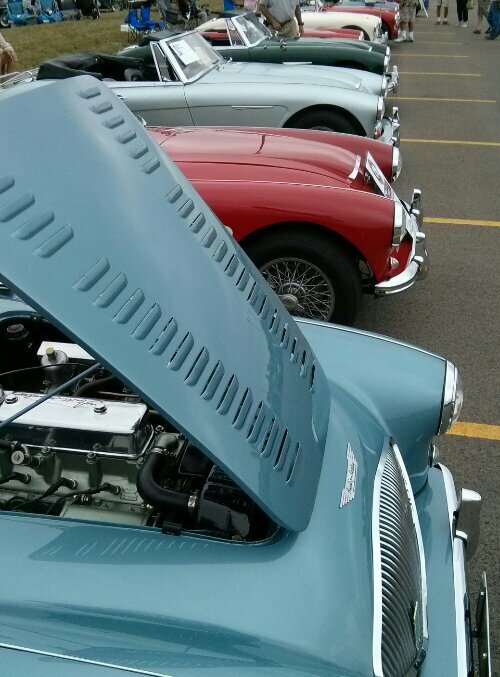 I’ll cover them as the week progresses but the included: Jaguar, MG, Triumph, Rolls Royce, Austin Healey, Mini, Morris Minor, Lotus, and Morgan to name several. 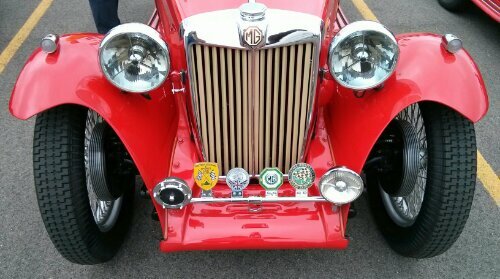 Plenty of them were in exceptional mechanical condition. Dedicated owners indeed. 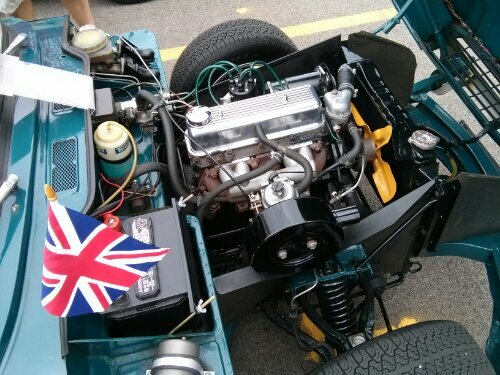 As I kept walking around I saw another, then another model to put on a desire list… But as with all things British and antiquated much effort is needed to keep them on the road. A motorcycle is hard enough! A well tooled garage space, time and funding all required for success.